Our curriculum focuses the student on their own learning and personal growth. From the Junior Cycle, through Transition Year and on to the Leaving Certificate, there are rich and varied opportunities for success in The Teresian Secondary School. Group and personal advice on career choice and vocational guidance are provided throughout the school. We assess students in a variety of ways and seek to acknowledge and reward student achievement in all areas. The Business Studies course is designed to create an awareness of the importance of business activity. It develops a positive and ethical attitude towards enterprise. Business Studies provides students with a learning foundation for a wide range of careers in business, marketing, law, enterprise and management. The English Department in The Teresian School aims to foster the confidence of students to think, reflect, respond and communicate. We seek to develop students’ awareness of the cultural richness and diversity of English. We encourage students to be creative through language and to gain enjoyment and continuing personal growth from reading, writing, speaking and listening. The department is heavily involved in activities that complement and add to the curriculum. Students have the opportunity to enjoy theatre excursions, cinema visits, poetry talks and compete in creative writing, public speaking and debating competitions. Debating and book club takes place during lunchtimes and are available to all students. Throughout the years students have attended a variety of productions of William Shakespeare’s plays as well as many other plays, including John B. Keane’s The Field, Charles Dicken’s Scrooge and Harper Lee’s To Kill a Mockingbird. As part of our whole school literacy plan we aim to create a heightened awareness about the importance of creating a culture of reading in our school. 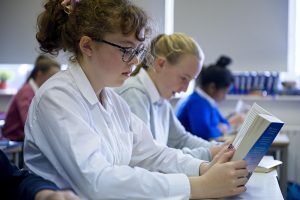 We have created new initiatives including: Drop, Everything and Read, and a monthly recommended reading list for both Junior and Senior students. We are also working towards the ‘Wellread National Award’. It is envisaged that this award will explicitly foster and nurture a reading culture in our school and will bring about an overall improvement in students’ literacy skills in a fun and engaging way. In The Teresian School French is taught at Junior and Senior cycle level. Every student is introduced to French Culture and Language. Students are taught about French speaking countries. They also learn how to introduce themselves and a variety of other themes are covered such as my family, my school and my sports. Students have the opportunity to participate in a French play during French Week and can exchange letters with French pen pals from a school in Paris. In Transition Year students are given the opportunity to go on an exchange to meet their pen pal. The oral communication classroom based assessment promotes student engagement through a choice of topic and communication formats. Students are also given the opportunity to work in pairs or groups. 3rd Year: Students continue to develop their language skills and prepare for their CBA 2 and final year exam. Senior Cycle (5th and 6th Year): Transition Year, 5th Year and 6th Year are given the opportunity to participate in the “Joutes Oratoires Françaises”. This year for the very first time our girls took part in the French Debate organised by l’Alliance Française. It is a great opportunity for the girls to improve their French language skills. It gives them the opportunity to express their opinions in another language on various topics in preparation for the Leaving Certificate. “The French Club” is an opportunity for all Junior Cycle students of modern languages to meet and spend one lunchtime per week talking about languages, facts, culture, and to work on competitions. Geography in The Teresian School prepares students for life. Our teachers tailor the Junior Cycle and Leaving Certificate curriculum content to suit the needs of each individual student and class group through a range of ICT resources and real world experiences. The Geography Department encourage students to enhance their understanding of class topics by making use of the great location of our Donnybrook campus. This puts us within easy reach of Dublin City Centre, Bull Island, the Dublin Mountains and Wicklow National Park. We encourage our students to embrace Geography in all its forms and to go beyond the confines of the curriculum with their learning. This produces students who truly know and understand how the world works, creating well-rounded individuals ready for the world. We encourage independent thinking and the development of critical thinking skills that allow students to form opinions, without jumping to unsupported conclusions. Home Economics in the Teresian School is a subject which intregrates theory with practice. It is concerned with the way individuals and families manage their resources to meet their physical, emotional, intellectual, social and economic needs. In a time of rapid social change, Home Economics is very pertinent to the present and future social, creative and management needs for living that are so fundamental in preparing every young person for the challenges and opportunities which they will meet in their lives. Students can participate in Home Economics at Junior and Senior level. Junior students relish the opportunity which cookery class brings, carrying home a miniture feast each week. At that level, students create outstanding crafts which are the envy of some high street craft shops. Transition Year students enjoy a module in Home Economics which explores various high end Fashion Houses and revel in delight at the vast array of practical cookery classes each week. Senior students enjoy a broad curriculum with much time dedicated to Food Studies, Resource Management and Social Studies. The Irish Department is a vibrant department in the Teresian School offering mixed ability classes from 1st to 3rd year of the Junior Cycle, with the opportunity of choosing Ordinary Level in 3rd year. 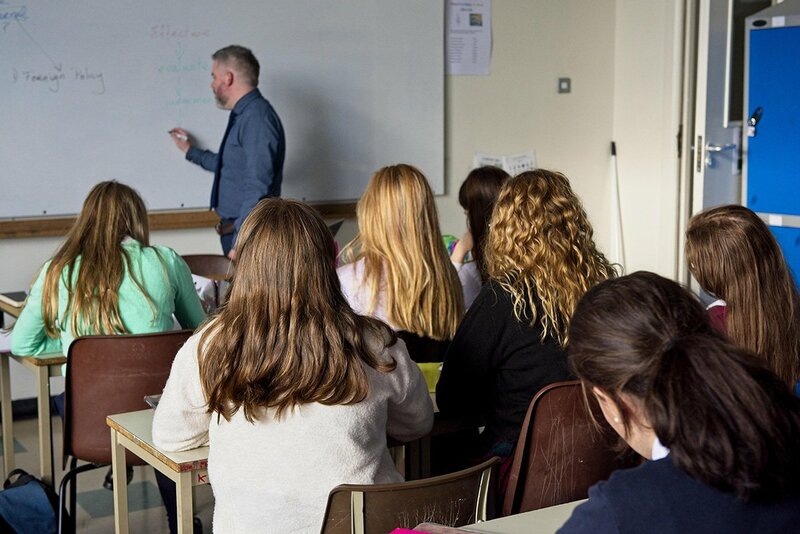 Classes for Junior Cycle give students ample opportunities to speak, read, listen and write in the Irish language, while simultaneously studying various texts such as: short stories, dramas, novels, songs and poems. Students get the opportunity to work individually, in pairs and in groups to perform in class and showcase their work. A mixed ability class is also available in Transition Year, where students study topics such as: their local area, dramas, the placenames of Ireland, the Gaeltacht and prepare for the Irish oral Fáinne exam. The TY programme enhances students’ understanding of the Leaving Certificate course which assists their decision making process when choosing which level they will take for Leaving Certificate. Higher and Ordinary Level classes are available in 5th and 6th Year for Leaving Certificate and students will study poetry, prose, film and a novel in depth. Students will study, discuss and debate complex, current issues and write comprehensive essays on these. Moreover, students will prepare for their Irish oral exam in 5th and 6th year, which is worth 40% of their overall Irish Leaving Cert grade. Furthermore, the Irish Department offers exciting extra-curricular activities. Debates are organised throughout the year with Gael Linn and “Craic agus Comhrá” is organised weekly where all students get the opportunity to meet at lunch to converse as Gaeilge, to play board games and watch Irish movies. Seachtain na Gaeilge is also an exciting week in The Teresian School with daily activities ranging from quizzes to debates, GAA skills to ceilí dancing and finishing off the week with a traditional musical concert! For students to see the real-life applications of Mathematics in their day-to-day lives. 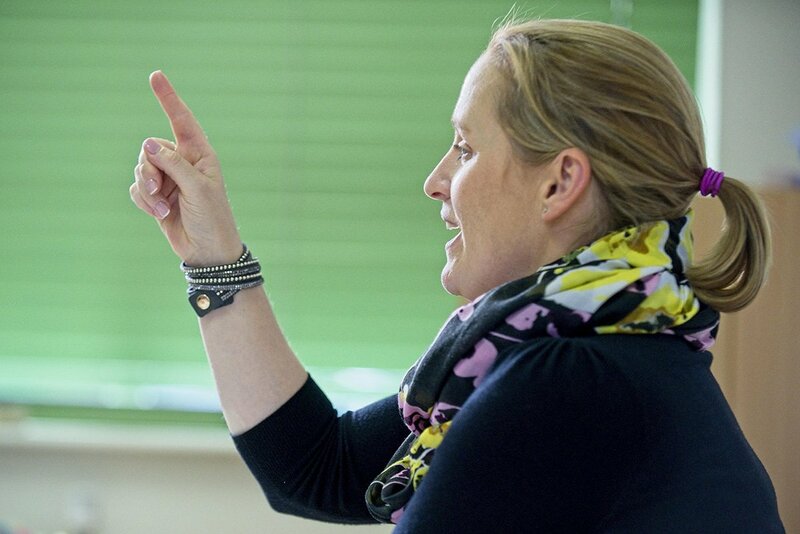 Develop a positive attitude towards learning Mathematics. Nurture qualities such as reasoning, creativity, abstract or spatial thinking, critical thinking, problem-solving abilities and effective communication skills. Develop a willingness to work collaboratively. The school has a long tradition of encouraging students to excel in what can be seen as a male dominated subject. In fact, the percentage of students in the Teresian School taking Higher Level at Junior Certificate and Leaving Certificate level is far beyond the national average. The new Junior Cycle has been introduced this year. Students complete a common level course in 1st Year in a mixed ability class. In 2nd Year and 3rd Year there is the option to move to Ordinary Level. Transition Year is an opportunity for teachers and students to assess their needs and to address any weaknesses before starting the Leaving Certificate course. This year is also used to work on problem solving, which features largely in state exams. It is also an opportunity to introduce the basics of Leaving Certificate topics. For Senior Cycle the year groups are divided into Higher Level and Ordinary Level and the course in covered in two years. The Mathematics Department organise and encourage students to attend Maths Café, which is run Tuesdays and Wednesdays during lunch time. Maths Café provides students with academic support which helps foster student’s confidence and develops their capabilities in an environment where both independent study and interaction with staff and fellow students are encouraged. Students are encouraged to participate in several Maths Competitions run by the IMTA and IAMTA. In 3rd year and Transition Year students compete in the Junior Problem Solving competition. In 3rd year students compete in the Pi quiz. In 6th year students compete in the Team Maths challenge. Since the launch of National Irish Maths Week in 2005 the school has always celebrated with quizzes, competitions and problem-solving puzzles. The Teresian School has a thriving Music Department in which students of all abilities have an opportunity to embrace music in a variety of ways. All 1st Year students are introduced to the three core strands of musical activities, listening, composing and performing. Students enjoy the performing aspect of the subject by using classroom instruments, learning ukulele and partaking in our ever-progressing school choir. Senior Cycle music encourages students to appreciate music from a range of styles and genres and develop the composing and performing skills acquired at Junior Cycle. Music technology is offered as a performance option at Senior Cycle. Students are involved in the preparation of music for the many school celebrations, concerts and assemblies. Ever a highlight of our school year, the Teresian school musical is open to everyone in non-exam years, regardless of whether they study music as a subject or not. The Teresian School’s Music Department aspires to meet the needs of all pupils whether they are composers, performers, or those who simply enjoy listening to music. Physical Education is at the heart of school life providing every student with the opportunity to fulfil their potential. The Physical Education curriculum offered at The Teresian School is designed with this in mind and serves to awake students’ interest and develop their skills, understanding and interest in a host of sporting experiences. At the heart of our philosophy is the desire to provide each of our students with the opportunity to access high quality physical education in an environment that allows everyone to progress, and also to understand the importance of an active healthy lifestyle and the value of working as part of a team. At The Teresian School, we offer a holistic education with the person of Jesus and joy of the Gospels at its centre. We take a ‘religion for life’ approach to RE which gives space for meditation, media, projects, discussion of contemporary issues of ethics and justice and a holistic expression of the spirituality of each student. With respect for all faiths and none, we endeavour to nurture the uniqueness of all students in our care, encourage them to be compassionate, knowledgeable and moral people, who become leaders of positive change in our community. The heart of the school, is our chapel where students have many opportunities to come together to be still, pray and meditate. At senior level, students continue with this ‘religion for life’ approach however, given the academic value of religious education, it is also offered as a Leaving Certificate examination subject for those who wish to study it. Throughout the year, the students have many opportunities to engage in liturgies and prayerful moments and all students have the privilege of experiencing a retreat day as a year group, cultivating relationships with self, others and God. At The Teresian School, RE reflects the school’s motto Joy, Fortitude and Love, in all it does and places the holistic development of the student as a uniquely spiritual and compassionate person as its centre. Science is studied by all students in the Secondary School up to Junior Cycle Level. Our Transition Year science programme includes tasters of Leaving Certificate Biology, Chemistry and Physics to help inform students as they choose their science subjects going into 5th Year. In general, the uptake of science subjects in The Teresian School at Senior Cycle is very high. STEM club: The club meets once a week for most of the year with enthusiastic participation sessions covering topics as diverse as DNA profiling to bridge building. SciFest@School: All 1st and 2nd Year participate in SciFest@School. Students carry out a scientific research project and present to external judges, and guests at a science fair in the school. SciFest@College: Students are given the opportunity to submit their SciFest projects to compete against students from other schools. BT Young Scientist and Technology Exhibition: 1st, 2nd and Transition Year students visit the exhibition every year. Students are also encouraged to submit projects to the competition. National Science Week: This is celebrated each year in the school. Activities range from whole school science quizzes and competitions to visiting speakers and shows and a special STEM club. Salters’ Festival of Chemistry, Trinity College Dublin: Each year a team of 1st Year students compete against 1st Year students from other schools. Irish Science Teachers Association annual Junior and Senior Science Quizzes: Our 3rd and 6th Years regularly take part in the annual Junior Science quiz in Belvedere College and Senior Science quiz in Trinity College Dublin. Spanish plays a very important role in the Teresian School. Being the language of our founder, Pedro Poveda, this subject can fully flourish thanks to the connections and friendships we have with our partner Teresian schools in Spain and beyond! Our Spanish curriculum from 1st year to the end of 5th year supports students in their learning by encouraging them to take on the many opportunities on offer. 1st Year: students take part in EDIT, a five day sports gathering in Spain where our students join other Teresian schools to take part in friendly sport competitions. This is an excellent first hand introduction to Spanish culture as the trip includes cultural visits and a great opportunity for cross-curricular learning. 2nd and 3rd Year: depending on the year, a school tour to Spain may be organised. This will typically include a visit to a Teresian school and related language exchange activities. In Dublin, we often welcome our partner Teresian schools while on tour in Ireland and organise language exchange activities. Transition Year: our Exchange Program in Transition Year with Alicante, Madrid and Valencia is an unique chance to boost oral Spanish through a four-week full immersion stay with a family of one of our Teresian schools. Students are encouraged to progress in their learning of Spanish by undertaking serious preparation towards the Spanish Certificate Diploma Exam (DELE). 5th Year: our students are given the opportunity to travel to Peru to work as volunteers during the summer at the end of 5th year. One year of preparation work goes into this exciting opportunity to explore Hispanic culture in Latin America and development education issues. Students fundraise during the year to support the Teresian after-school centre for unprivileged children in Villa El Salvador (Lima) where they will spend two weeks. Students who do not avail of this opportunity, can take part in other stimulating opportunities such as Spanish debating, video competitions etc. I have had the pleasure of teaching Art in The Teresian School for the last twenty years, it has been truly gratifying to witness the pleasure and enjoyment that students derive from this creative and rewarding subject. All 1st Year students sample Visual Art and it is then available as an option subject for Junior Cycle. All students once again get to experience Art in Transition year. Art Craft and Design is an option subject for the Leaving Certification. There is a very healthy take up of the subject in both Junior and Senior cycle and students continually impress me with the outstanding grades that they achieve. The Teresian school not only considers Art as an important academic subject but also relevant to the Povedan ethos which emphasises a rounded approach to education. In the Teresian school Art offers students a safe space to explore and develope their creativity, express ideas and comment on the world. Students who choose art as a subject do so for a variety of reasons. For some it has allowed them to pursue careers in the Arts, (fashion, design and architecture), while for others it has assisted them in achieving results that allow them to develop successful careers in medicine, business, law or engineering. Regardless of the career path chosen, students report that the study of art has helped them develop as people, through engendering a sense of creativity and curiosity, as well as cultivating a critical mind. The Framework for Junior Cycle (2015) provides for a new area of learning at Junior Cycle called Wellbeing. Wellbeing will cross the three years of Junior Cycle and build on substantial work already taking place in schools in support of students’ wellbeing. This area of learning will make the school’s culture, ethos and commitment to wellbeing visible to students. It will include learning opportunities to enhance the physical, mental, emotional and social wellbeing of students. It will enable students to build life skills and develop a strong sense of connectedness to their school and to their community. SPHE is compulsory for all Junior Cycle students. The programme includes an optional six weeks module on Relationships and Sexuality. RSE is taught to Senior Cycle students during Religious Education class for a specified six periods in both 5th and 6th Year. Through participating in the SPHE programme our students encounter a wide range of issues through a variety of learning experiences. These include physical and mental health, communication, relationships, sexuality, influences and decision making, substance abuse and personal safety. The emphasis is on building a foundation of skills, values, attitudes and understanding relevant to all these areas. Classes are presented in a way that is mindful and complimentary to the Teresian ethos. To enable students to develop good skills for self-fulfilment and to develop self-esteem and self-confidence. Help students to develop a framework for responsible decision making. To promote physical, emotional and mental health and wellbeing. Promote positive attitude to work and study. Allow for assessment and provide positive feedback of student’s achievement. Present classes in a way that is in keeping with the Teresian ethos.